For complete Sky Commander DCS details please see http://skyeng.com/. The Eyepiece Tray has a special angled platform added to allow the Sky Commander to be mounted under the tray at a convenient angle. This places the Sky Commander at an even more convenient position than the Top Mount, especially when seated. The Sky Commander is attached with Velcro to allow easy removal for transport or storage. 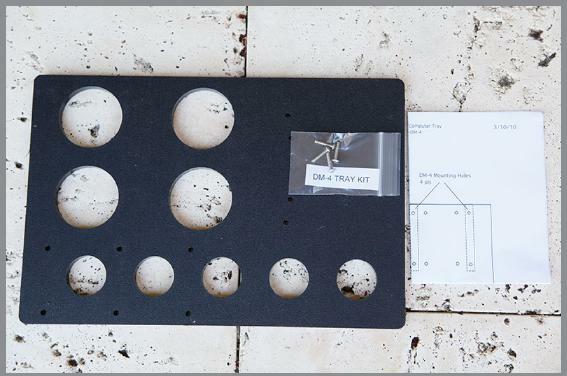 Eyepiece Tray has 4 holes for 2” eyepieces and 5 holes for 1 ¼" eyepieces. It can be easily removed for transport or storage by 4 screws. There’s even room to mount a small computer. Link to Eyepiece tray page. Comes with Sky Commander XP-4, Manual, Encoders, internal cabling and Eyepiece Tray with SkyCommander mount. All you need to make your DM-4 PUSH-TO.